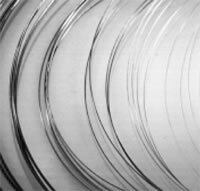 Nitinol Wire (also known as 'Muscle Wire' or 'Memory Wire') is a thin strand of a special shape memory alloy composed primarily of Nickel (Ni) and Titanium (Ti). The name 'Nitinol' was derived from its place of discovery (Nickel Titanium Naval Ordinance Laboratory). Nitinol Wire will amazingly shorten in length (with significant force) when electrically powered (or heated by other means). It is easy to use, and the thin strands of wire can lift thousands of times their own weight. Nitinol wire returns to its original length when it cools. The direct linear motion of Muscle Wires offers experimenters a source of motion that is very similar to that of a human muscle, providing possibilities not available with motors or solenoids. Nitinol Wire may be heated by any means, air temperature, hot water, or most commonly by running electric current through it. Its activation or 'transition' temperature is 158 °F ( 70°C ). There are endless possibilities of what can be created using this material. We've already seen an amazing array of inventive ideas such as: postage stamp-sized walking robots, model paddle boats that 'paddle' just using the heat of warm water, electrically powered light weight rudder & flap controls for model airplanes, etc. Compared to motors or solenoids, Nitinol Wire has many advantages: small size, light weight, low power, a very high strength-to-weight ratio, precise control, AC or DC activation, long life, and direct linear action. These features let you create whole categories of amazing new devices that would be difficult or impossible to do with anything else. Just start tinkering with this unusual material and you'll come up with a bunch of interesting & unique applications! Sold in 12" lengths, one to a package.